This is the second post in the “Using jQuery in ASP.NET applications” series where we tackle the how you can access your code base with a jQuery ajax call. Enter a name and a location and click the OK button. Visual Studio will now ask you if you want to create an empty, an intranet or an Internet application. Let’s choose the last one. For the view engine choose Razor. We don’t need any unit tests in this demo so leave the “create a unit test project” unchecked and click the OK button. We will reuse the simple demo application we created in the previous blog post that will let a user add his favorite book title to his wish list. 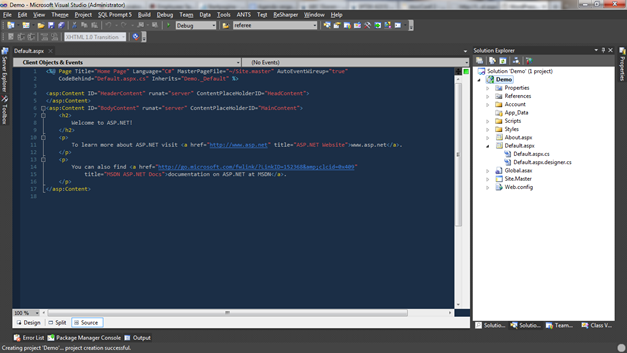 Hit run (F5) in Visual Studio and our fabulous designed application will open up in a browser. As mentioned before, the focus is this post is the implementation of the ajax call, not the design of the application. In solution explorer right click on the Scripts folder and choose Add => New Item. In the window that will appear select Jscript file, name it Home.js and click the Add button. We still have to create a reference to our custom created Home.js file in our view. Open up the index.cshtml again and add the section tag at the top of the view. In that section add a reference to the Home.js file. Hit Run (F5) again in Visual Studio and our page should still look the same. 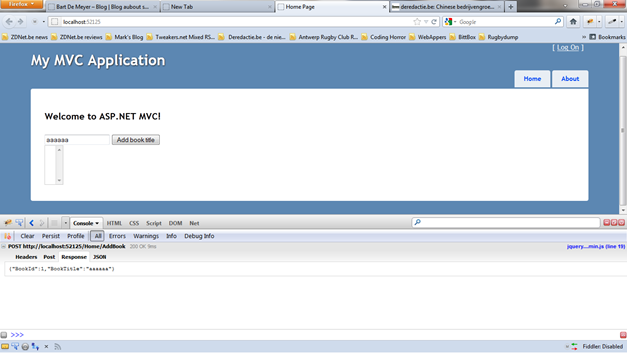 In MVC adding a ajax method is as simple as adding an action in our controller. Instead of returning a View we’ll return a JsonResult that will convert our .NET book class to a Json representation. I’ve added a static string to hold the session name and a private helper method to generate an id for the added book based on the list in the session. In the return statement we create the Json object we want to send to the client. Don’t forget the JsonRequestBehavior.AllowGet flag to allow GET requests to this method! If we run the application and open up a Firebug screen (in Internet explorer you can use the Developer Tools as you can use these in the Chrome browser). After clicking the button we see a async request to the server that returns an JSON object representing our book. All we now have to do is to implement the success function so our returned book is added to the list of book titles. If your un the application now you’ll see the book titles are added to the list, all with their id. From here you can implement delete, edit and other functions. Next post will be how we can refactor the above so we create an API that’s not tied to a specific controller. 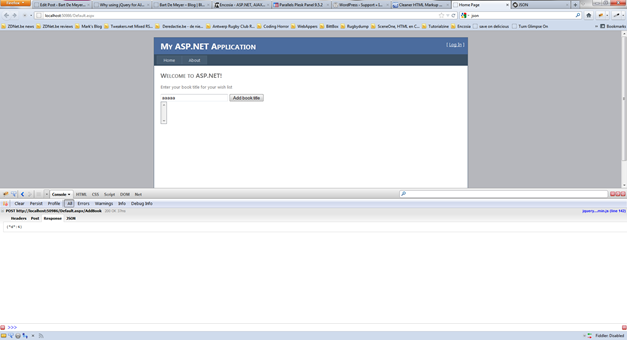 This entry was posted in .NET, AJAX, Development, jQuery, JSON on 24 February 2012 by Bart De Meyer. After the previous post (Why using jQuery for AJAX calls before the Ajax Control Toolkit)we going to see in this post how you can set up a Web Forms project and how you can easily can create Ajax calls to your code behind. 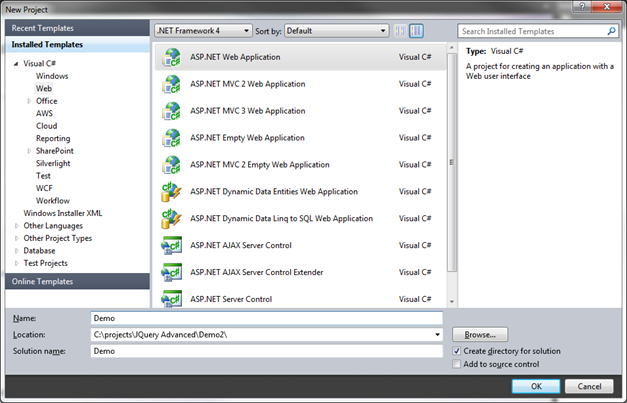 Open Visual Studio and create a new ASP.NET Web Application. Enter a name and a location and click the OK button. 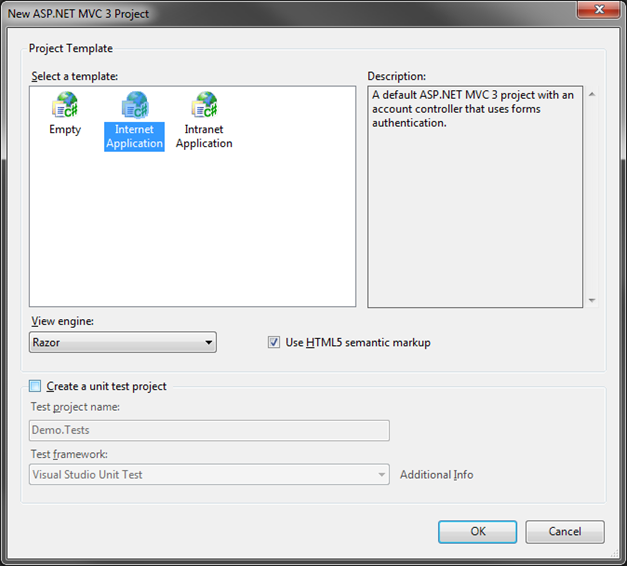 Visual Studio will now create a standard Web Forms application. 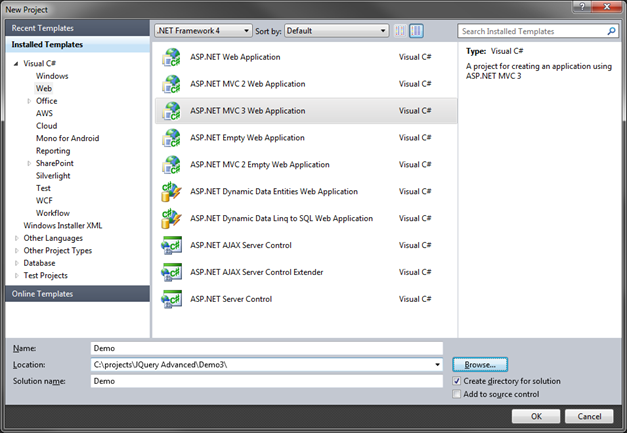 In this example I’m using the .Net 4.0 framework although older versions will work as well (up to 2.0). As demo we’ll create a simple application that allows the user to add a book to his wish list. The user has to fill his favorite book title. After pressing add we’ll show the added book in a list underneath. The user can add as many book titles as he wishes. Let’s start with updating the Default.aspx page with some text and a textbox where the user can add the book title. Under this textbox we place a button to add the title to the list and the list itself. As you can see this is a VERY simple application where the emphasis lies on the creation of the Ajax call, not the application itself. One side note: I declared the ClientIDMode Static in the page directive. This will be necessary to implement the jQuery with the same id’s we have given the controls in the aspx page. More info on this blog post of Scot Guthrie. Our fabulous application now should look like the image below. Now we’re ready to start coding. Now we can create the method body. It’s not that much work, we’re going to store the added book titles in a session object. I’ve created a helper method to get the next available Id so our list can’t contain the same id twice. Build your application and hit Run. Our Default page should open in a browser window without any changes. Open up the Default.aspx.js file we created. In this file we will add an event handler on the submit button. When the button is clicked we’ll call the code behind method and add the title to the list stored in the session variable. Add the following lines to the file and run the application. This is all we have to add to contact our code behind method. If you run the application and open up Firebug in firefox or the developer tools in Internet Explorer 9 or the developer tools in Google Chrome well see in the NET tab we make a async call to the server and receive the id of the book title we’ve added. We create a variable $bookId to store the id in we receive from the server. 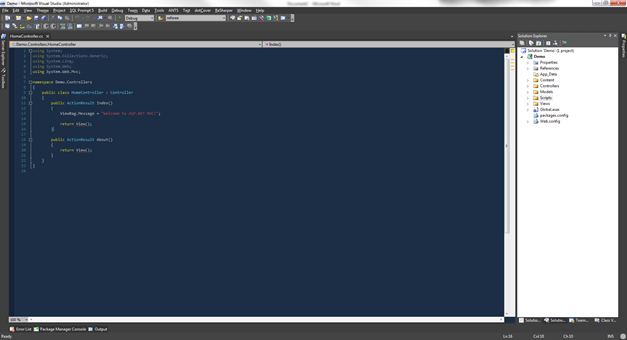 As you can see the return message is wrapped in a “d” variable. This is changed in the .NET 3.5 version. More info in Dave Ward’s post on Encosia. After that we create an option to be added in the listbox and append it to this box. If we run the application now well see that every time a book title is added, it’s send asynchronously to the server. We receive an id from the server and the book title is added to the listbox. 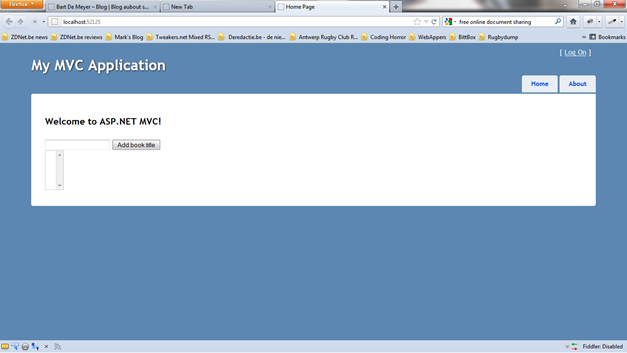 Next post will be about implementing AJAX calls in ASP.NET MVC 3 project. 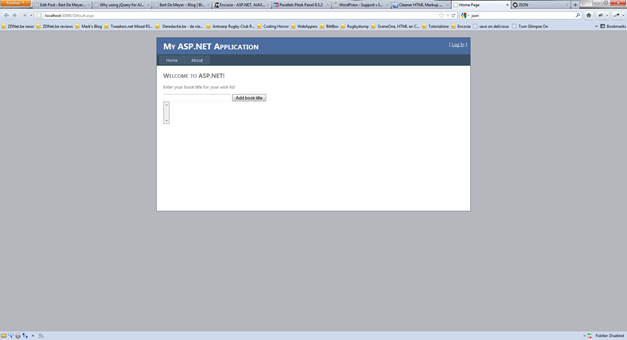 This entry was posted in .NET, AJAX, Development, jQuery on 21 February 2012 by Bart De Meyer. Every starting developer in ASP.NET who wanted to integrate AJAX functionality in his web application first started with the Ajax Control Toolkit. It’s easy to understand, in Web Forms it’s almost not more than a drag and drop implementation. After a while you start to notice the limitations. You want to create a functionality that’s not integrated in the toolkit. You start with extending methods, extending properties and get stuck every time again. The amount of update panels start to grow above your head and on every postback you’re have to test if the postback is a Ajax post back or not. In your UI you start to see some disadvantages, the focus is lost when a update panel is updated, you’re page jumps back to the top and so one. One of the most disturbing issues I found was the load from and to the server. For a simple update of a textbox, the whole content of the update panel is send in the background to update your page. In the first screenshot you see a (very) simple example. The value typed into the textbox has to be added to the list underneath without submitting the page. After creating the update panel and added a script manager we implemented the async postback. A 1024 character response, including all controls that are in the update panel. As you can see in this (very) simple example, the difference between the implementing a async callback with the toolkit and jQuery gives us an advantage of 951 characters. You can imagine what the difference would be in a page with let’s say 50 controls on their. For simple Ajax functionality the toolkit is an excellent choice for a beginning developer. A developer who doesn’t want to know what’s going on in the background. He updates a drop down list and the correct value appears in the textbox underneath. What triggered it and how it’s used, he (or she) doesn’t care. They still maintain and renew the toolkit as you can see on Stephen Walter’s blog. I do care. I’m one of those guys who want to know what’s going on in the background, so I can extend functionality, create my own controls and so one. And I do care about the traffic I generate.